Your Toyota Avalon floor mats are meant to protect the value of your car. If they weren't there, your carpet would quickly be stained or damaged. OEM Toyota Avalon floor mats are exact factory floor mat replacements and are the same quality and fit as your original floor mats. These help protect the appearance and maintain the value of your Avalon. Don’t settle for aftermarket floor mats. They're often made to be universal, fitting all large sedans. 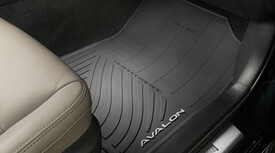 OEM floor mats fit your Avalon perfectly. Aftermarket mats also aren't as high quality as the factory replacements. When you shop with us, you’ll get high quality OEM Avalon floor mats at wholesale prices plus fast, affordable shipping. Get your genuine OEM Avalon floor mats and other parts from us now.